Prime Minister Narendra Modi at a rally in Chhatarpur today. With only a few days of campaigning left for the electoral battle in four states, political leaders including Prime Minister Narendra Modi, BJP chief Amit Shah and Congress president Rahul Gandhi addressed different rallies today, garnering support for their party candidates. In Mizoram, ruling Congress and opposition parties MNF and ZPM have also stepped up campaigning in the state. Prime Minister Narendra Modi on Friday accused the Congress of ignoring development in Mizoram and said that the northeast has moved beyond shutdowns, guns and blockades. In Madhya Pradesh's Vidisha, Mr Gandhi accused PM Modi of remaining silent over his government's failure to do anything substantial for farmers and the poor in the past four-and-half years. Madhya Pradesh and Mizoram will vote on November 28 while Rajasthan and Telangana will vote on December 7. Results for the elections in all the five states, including Chhattisgarh, will be announced on December 11. Addressing a poll rally, BJP President Amit Shah launched a full-voltage attack on the Congress, saying the country's grand old party does not have "a Senapati" to win the elections in the state. "We are contesting this election with Shivraj Singh Chouhan as our chief ministerial candidate under Prime Minister Narendra Modi's leadership. Who is Rahul Gandhi's 'Senapati' (chief ministerial candidate)? Can one win the election on the basis of a king, an emperor and a tired businessman?" he said. Targetting the Nehru-Gandhi family, PM said farmers would not have been "ruined" had Sardar Vallabhbhai Patel been the country's first prime minister. "Farmers are suffering due to the wrong policies of the Congress governments...the result is that farmers are suffering...now, they (the Congress) are defaming us. "But the farmers would not have been ruined during the Congress's 55-year-rule had Sardar Vallabhbhai Patel been the country's first prime minister," he said. Attacking the Congress, Prime Minister Modi said, "This generation of farmers are suffering due to the the wrong doings and wrong policies of the Congress. Even our govts are facing bad names for those things. Aaj jab unki nitiya ulti pad rahi hai woh aage aake zyada se zyada cheekh rahe hain." It has been 15 years since MP comprehensively rejected the Congress and under BJP, the state has seen unparalleled growth. Days of Congress' 'divide and rule' are over, now only the BJP's development agenda strikes a chord with the people. Completing projects on time is not the interest of the Congress. Their interest lies in awarding contracts to known persons. In the last few years, many projects of MP pending at the level of the Centre have been completed. This has benefitted the state's people. Uttar Pradesh Chief Minister Yogi Adityanath reaches Bhopal to address a rally. "I read Kamal Nath's statement which said they don't need the votes of SC/ST people, the Congress only needs Muslim votes. Kamal Nathji, keep your Ali, Bajrangbali is enough for us," says Yogi Adityanath. "Before abusing Shiraj Singh Chauhan, think about your own 'Mama'. 'Mama' Ottavio Quattrocchai and Warren Anderson who were sent to America in a special airplane. 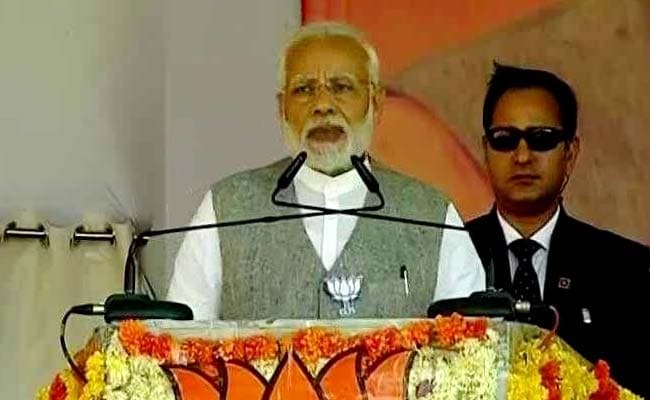 Accused of Bhopal gas tragedy victims' deaths, he was secretly dispatched there," Says PM Modi. Congress President Rahul Gandhi addresses a public gathering in Damoh. "I ask the youth of Madhya Pradesh to listen to Mr Modi's speeches. He doesn't talk about employment and farmers anymore. His speeches are filled with hatred and anger. And this is because he knows he has lost people's faith," the Congress President says. PM Modi is afraid that he will lose and this fear is driving his hatred, he adds. Congress President Rahul Gandhi says the BJP government shot at farmers in Mandsaur. "Farmers pay insurance money and all the benefit goes to insurance companies," he adds. 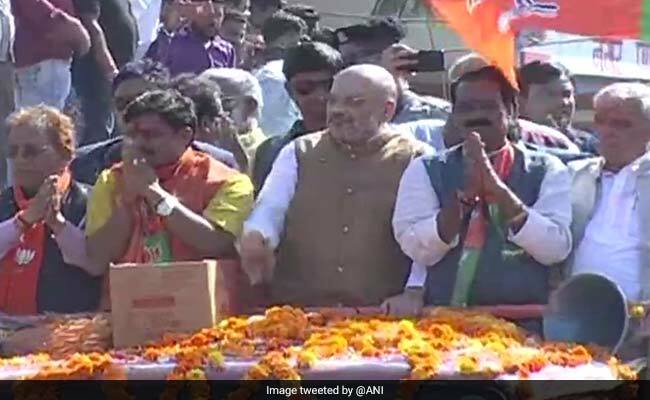 BJP chief Amit Shah holds a road show in Ashoknagar, Madhya Pradesh. "Four generations of the Congress, and four years of a tea-seller. They are not ready to talk about the new heights we have taken our country to. 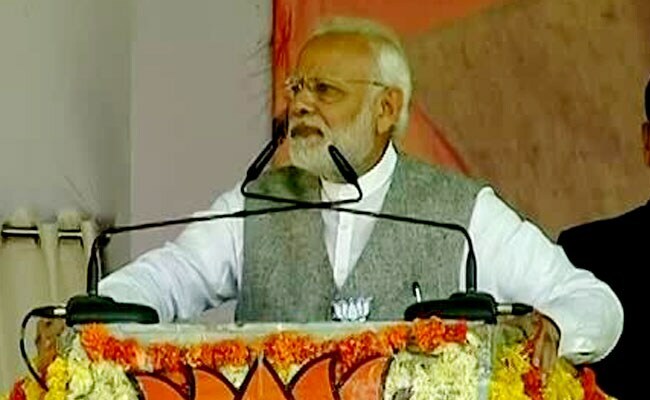 Whenever there is a fight in a colony, you must have seen how the person who doesn't have truth on their side, starts abusing your mother," PM Modi tells a gathering in Chhatarpur. "People of Madhya Pradesh have made up their minds to remove Shivraj Chouhan govt. And in few months Mr 56 inch's govt will also be removed," says Congress President Rahul Gandhi. "Every CM in a BJP ruled state is involved in scams, where public money is stolen," he adds. Numerous efforts are being made towards water conservation and ensuring farmers of this region get water, says PM Modi in Chhatarpur. "The people of India are our high command. We are committed to serve them and fulfill all their aspirations," he adds. People born with a golden spoon in hand are "confused" while their party is "fused", says PM. "The Congress party has lost courage to compete with Modi, so now the Congress workers are abusing Modi's mother," says PM Modi in Chhatarpur. Congress chief asks how are all three -- Narendra Modi, Lalit Modi and Nirav Modi - Modis? "He (PM Modi) addresses people as "Bhai". Anil Ambani is also his "Bhai". During demonetization, women, farmers, everyone was forced to stand in a line. He (PM Modi) said it is a fight against black money. Why didn't the thieves line up in front of the ATMs? Instead, Mehul Choksi fled with thousands of crores of rupees," he adds. Congress President Rahul Gandhi addresses a public gathering in Sagar, Madhya Pradesh. "In the last 15 years, you have seen the change in Bundelkhand. The change was brought about not by kings but Shivraj Raj Chauhan. When you vote, you have to remember the reason why 15 years ago you defeated the Congress," PM Modi tells a public gathering. PM Modi says people who crossed 40 years of age remember all the problems during Congress rule. "Will you let your children face the same problems? Do you like the life you lived back then? 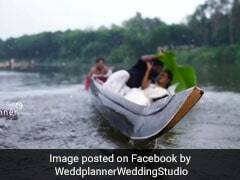 If you don't want a life like this, Madhya Pradesh, Chattarapur and everyone else will have to make a decision," he adds. "We are entering the last phase of elections. Enthusiasm for BJP is increasing. The Congress is losing... There is no hope for winning. Who will bail out whom is their worry," says PM Modi in Chhatarpur. PM Narendra Modi addresses a public meeting in Chhatarpur. Uttar Pradesh Chief Minister Yogi Adityanath will hold multiple public rallies in Madhya Pradesh today. He will be in Sagar, Vidisha, Bhopal, Indore and Ujjain. PM Modi is scheduled to hold a rally in Mandsaur and Chhatarpur while Bharatiya Janata Party (BJP) president Amit Shah will address a poll rally and participate in a roadshow at Ashoknagar in Gwalior today. Mr Shah will also visit Navrar (Karera), Bhind and Morena in Chambal regions, and address rallies at Neemuch, Kukshi (Dhar), Sanver (Indore) and Ratlam. Meanwhile, Congress' Rahul Gandhi is scheduled to campaign in Sagar, Damoh and Tikamgarh today.